Bipolar disorder is a psychiatric disorder whose main characteristics are extreme mood swings. These mood swings range from extreme depression and lack of motivation to a very energetic mood. And this is where the definitions of “mania” and “hypomania” come in. Mania can be defined as an episode of extremely high energy and euphoric behaviour. This is associated with patients suffering from bipolar disorder. Hypomania is often said to be a mild form of mania. It can be considered one of the three stages of mania. Hypomania is often confused with regular mood swings. As mentioned before, hypomania is considered a mild form of mania. The symptoms are similar, but on mania they are enhanced and can be more negative. While hypomania can be relatively harmless and even good from a certain point of view, mania can really disrupt the patient’s life. The problem is that hypomania can evolve to mania in patients who suffer from bipolar disorder, and that’s where the problem begins. 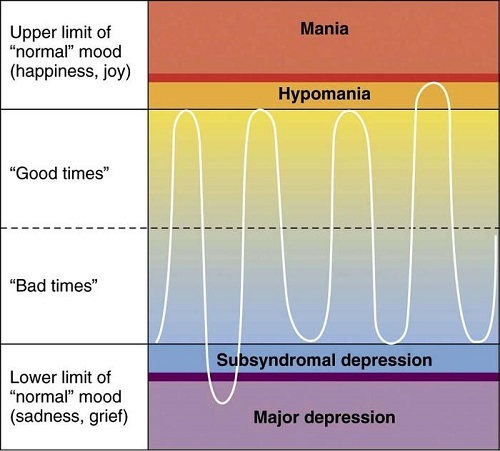 The table below shows the different stages of mania and its characteristics. The stage 1 is where the hypomania would fit. Although hypomania is often considered a stage of mania, or a mild variation of it, there are a few differences between both. Hypomania is usually brief and lasts less than a week. On the other hand, the duration of mania is at least one week. The symptoms on hypomania are quite mild, and can often be seen as positive. There is a mood elevation, higher energy and sociability. On mania these symptoms are too enhanced and intense, which is very harmful. Depending on the stage of mania that the patient is, he can become a threat to himself and society, and hospitalization is inevitable. An intense episode of mania may be accompanied by delusions, hallucinations and/or psychotic behaviour, while hypomania is never accompanied by this type of behaviour. While mania can be divided into 3 stages, hypomania is not divided. In fact, it can be considered one of the stages of mania. So, based on all this information it’s possible to say that the main difference between hypomania and mania is the intensity of the symptoms. Although both are related to the mood swings of bipolar disorder, there are differences between both conditions. The main characteristics of hypomania are: an increase in energy, a quick thought process, increased sociability and euphoria. This can result in a higher productivity. While hypomania may seem very beneficial at first, because of all the energy and good mood that the patient presents, it can evolve to mania where a real problem starts. There are different stages of mania, where the patients can range from depressive to aggressive behaviour. In later stages, the patient can present psychosis and hallucinations, and at this point the person need to be moved to a hospital. julia silveria. "Difference between Hypomania and Mania." DifferenceBetween.net. May 31, 2018 < http://www.differencebetween.net/science/health/difference-between-hypomania-and-mania/ >. Moreno, Ricardo Alberto et al. "Diagnóstico, Tratamento E Prevenção Da Mania E Da Hipomania No Transtorno Bipolar." Archives Of Clinical Psychiatry (São Paulo), vol 32, 2005, pp. 39-48. Fapunifesp (Scielo), doi:10.1590/s0101-60832005000700007. Proudfoot, Judith et al. "The Precipitants Of Manic/Hypomanic Episodes In The Context Of Bipolar Disorder: A Review." Journal Of Affective Disorders, vol 133, no. 3, 2011, pp. 381-387. Elsevier BV, doi:10.1016/j.jad.2010.10.051.